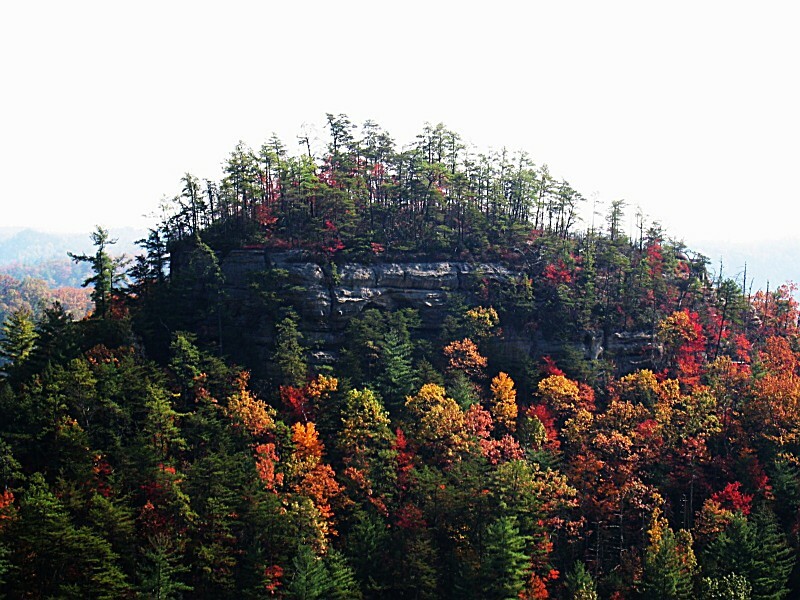 This shot was taken on a hike through the Red River Gorge. 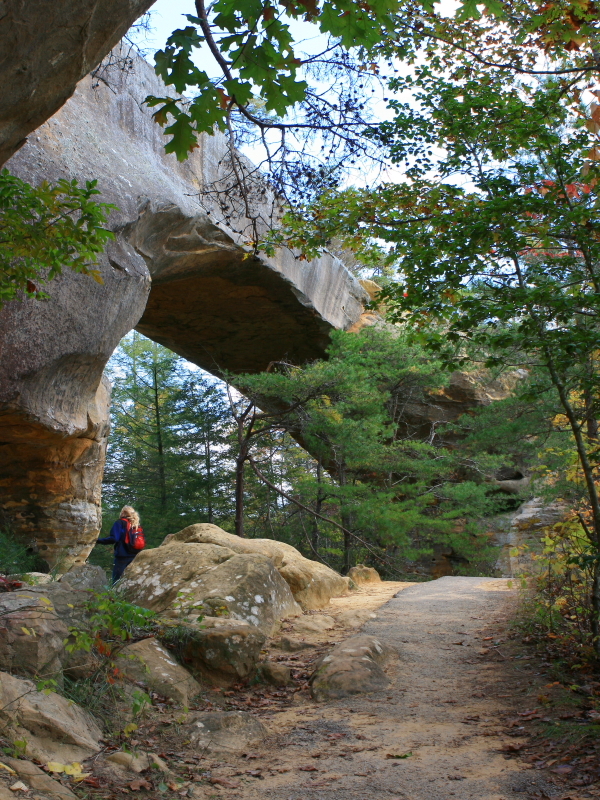 This arch is named Sky Bridge. 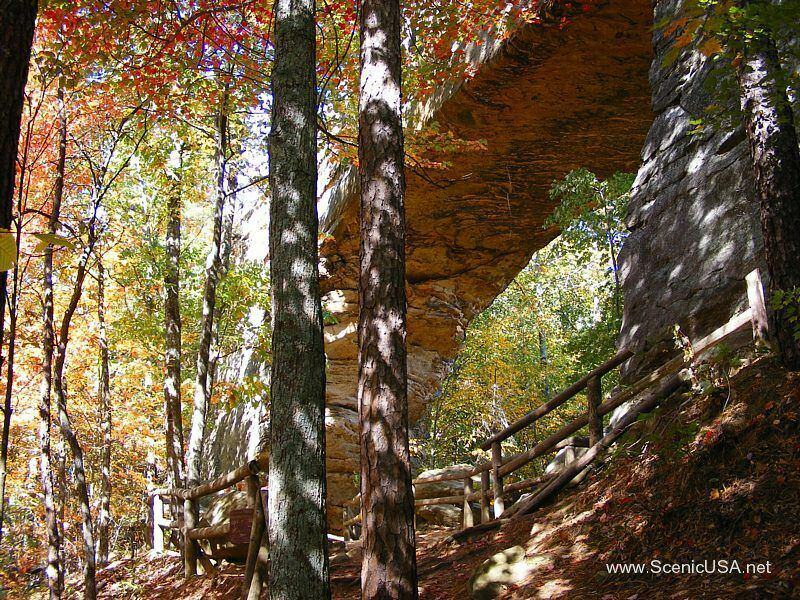 It has taken nature millions of years to form the natural sandstone arch from which this park takes its name. 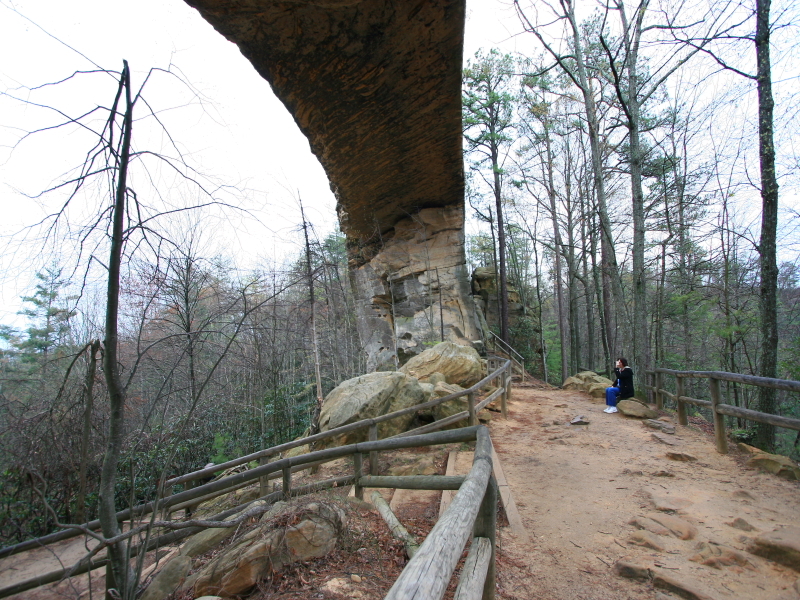 Located adjacent to the Daniel Boone National Forest, near the Red River Gorge Geological Area, the bridge spans 78 feet and is 65 feet high. 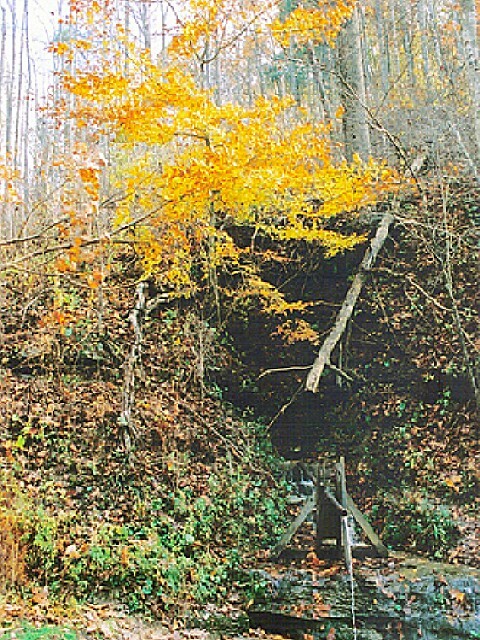 At Natural Bridge, each season has a unique charm. 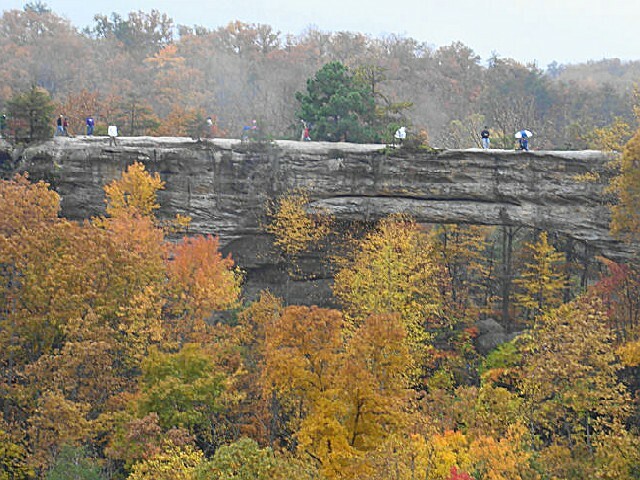 Hikers are drawn to this rugged, scenic area of high stone cliffs and stone arches, but tenderfoots can also enjoy the scenic, ridge-top views from the park?s sky lift. Hemlock Lodge is nestled in the mountainside, overlooking a pool complex and Hoedown Island. Try one of the park?s cottages. Step out of your cottage into the beautiful ambiance of the surrounding forest. You will be encompassed by beauty in one of four two-bedroom, or seven one-bedroom cottages. Tableware, cooking utensils, and linens are provided, with fresh linens available daily. Open year-round. Cottages are available by late afternoon. Check-out by 11:00 AM, Eastern time. Enjoy the great outdoors in a park campsite. 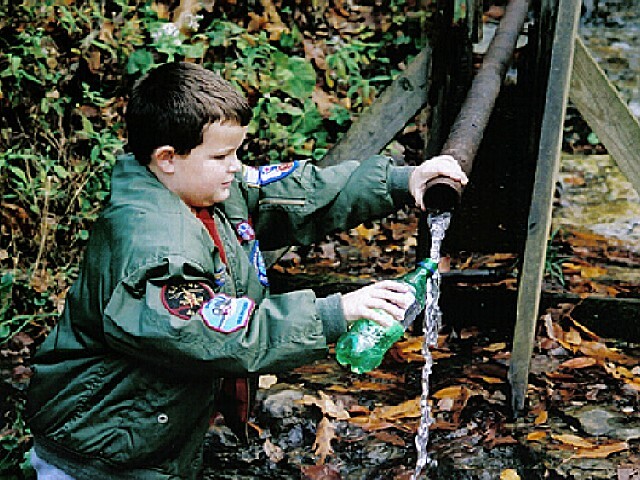 Two campgrounds, Whittleton Campground and Middle Fork Campground, provide 82 sites with utilities. 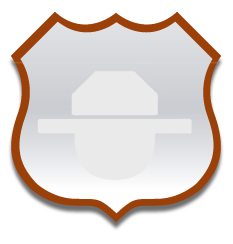 Twelve primitive campsites are also available. 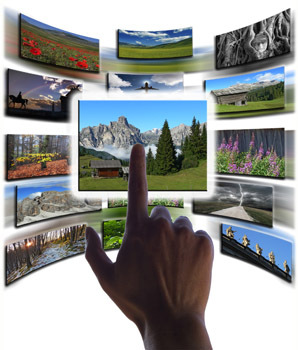 Dump stations and two central service buildings with rest rooms and showers are furnished for your convenience. Open Mid-March through October 31. No advance reservations. Check-out by 2:00 PM, Eastern time.Pets are allowed if restrained. Delight in the mountainside beauty of Hemlock Lodge. The 35 rooms of Hemlock Lodge have private balconies. Open year-round. Rooms are available by late afternoon. Check-out by 1100am, local time. A limited number of lodge rooms will be available for pets. Tucked between the lake and the cliff beneath Hemlock Lodge is a new pool complex. The complex includes a spacious stone bathhouse, and a zero-depth (one can enter pool without steps) pool that holds 80,000 gallons of water. The main pool has a "river" theme with directional water jets and floor bubblers. Next to the main pool is a new fenced wading pool with floor bubbles and fountain. Open seasonally and free to lodge and cottage guests. Open to the public Memorial Day through Labor Day when lifeguards are on duty. Weekdays $3 adult, $2 child W weekends $4 adult, $3 child. After mid-August, lifeguards are at the pool Saturday and Sunday only from 11 AM-6PM. 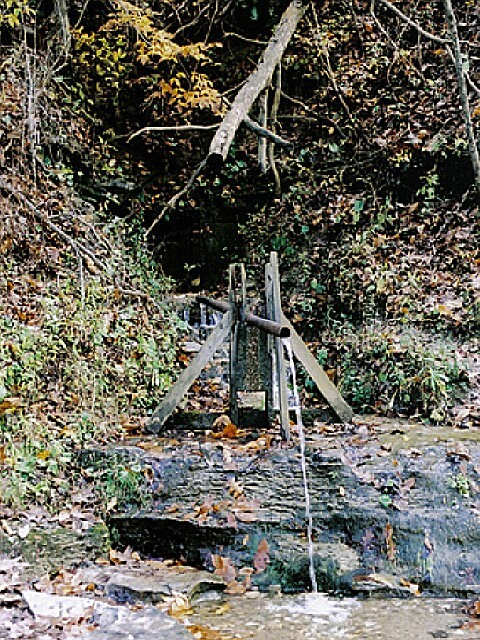 The ten hiking trails range from one-half mile to seven-and-one-half miles. Trail maps are available at the Hemlock Lodge. The Nature Center, located on the ground floor of the Activities Center, houses exhibits about the park. 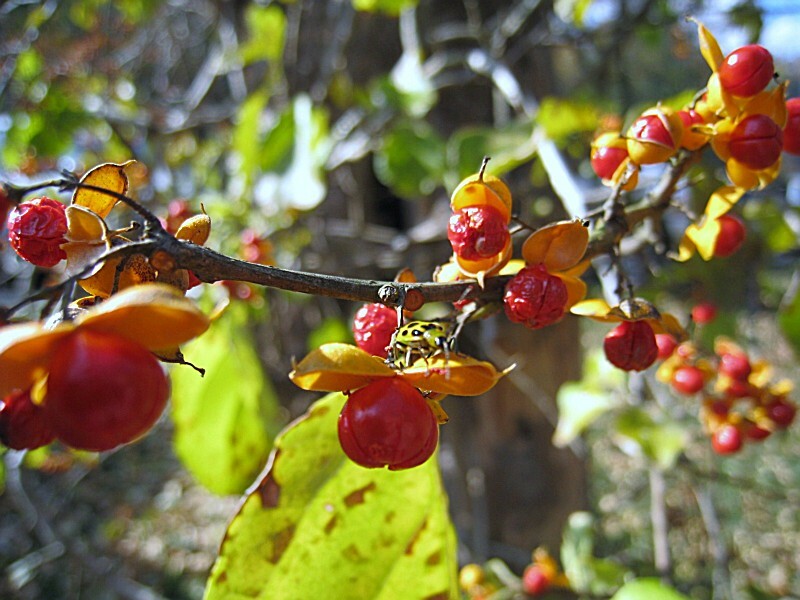 Full-time naturalists program events and activities year-round focusing on native plants animals, geology, and local history. Daily summer activitiesare directed by recreation staff. 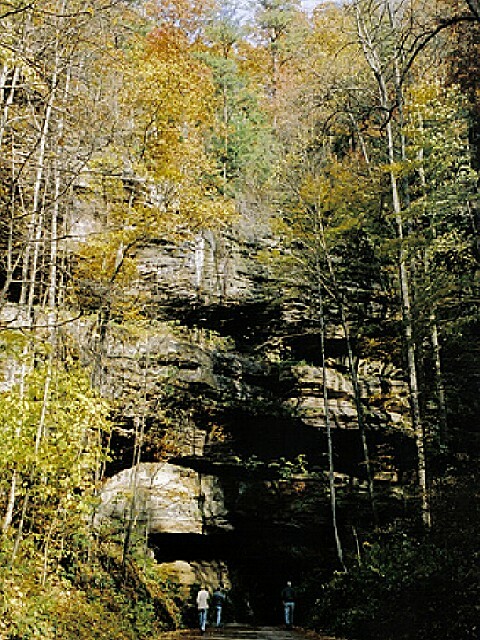 The parks is adjacent to the U.S. Forest Service Red River Gorge Geological Area which also offers plenty of hiking opportunities. 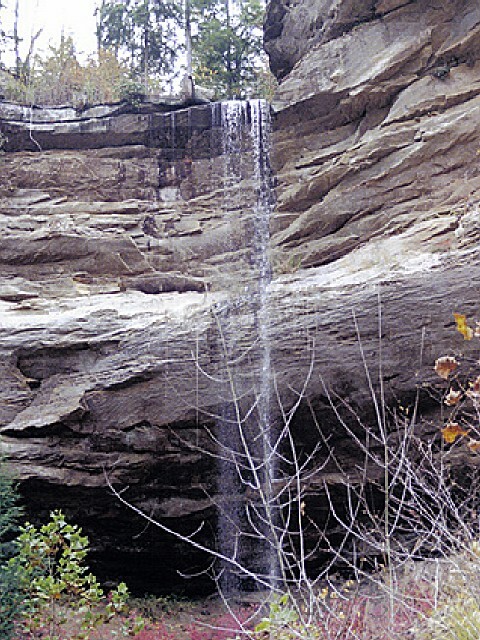 Pets are not permitted on the hiking trails in Natural Bridge State Resort Park. Natural Bridge State Resort Park offers more than just a fun family vacation. Our staff of professional Naturalists is available year-round to provide interpretive programs for groups of all sizes and ages, from school groups to seniors, scouts to corporate outings. The best time to bird watch is in May and June when the woodland warblers and other neotropical birds return and are most vocal and active. The Fall migration is also good, in late September. Winter bird watching at the park can be fun because many of the leaves have dropped, making it easier to view various species of woodpeckers, kinglets, nuthatches, wrens, and sparrows. Year-round residents inlcude northern cardinal, American goldfinch, indigo bunting, song sparrow, belted kingfisher, American crow, great blue heron, wild turkey, pileated woodpecker, Carolina chickadee, tufted titmouse, white-breasted nuthatch, and Carolina wren. Best places to spot our feathered friends Hoods Branch Trail, Rock Garden Trail, Whittleton Branch Trail, Lakeside Trail, Mill Creek Lake, Picnic Shelter 3 4 area. Hoedown IslandMosey on down to Hoe Down Island where knee-slappin?, toe-tappin?, and swingin? your partner is a barrel of fun! Located on the lake below the lodge, this island is an open-air dance patio for weekly square dances. Seasonal with weather. Call park for annual brochure. Park also holds Square Dance Weekends throughout the year. Sky LiftFor a relaxing climb to natural bridge, enjoy a ride on the sky lift. 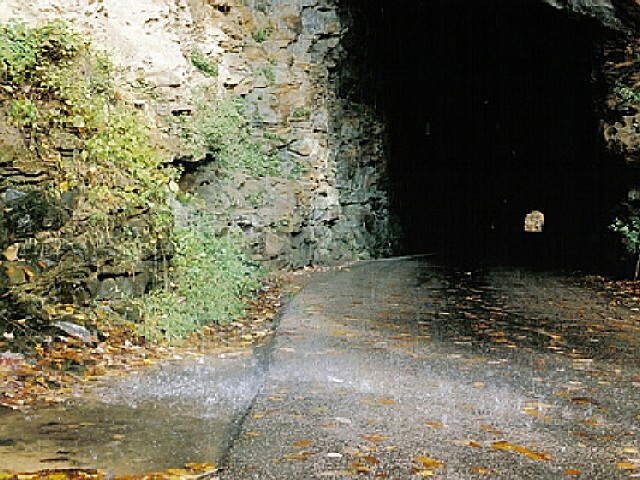 The ascent begins one-half mile from the park entrance and ends within 600 feet of Natural Bridge. Open daily first weekend of April through the last weekend in October, $. Snack BarsTwo snack bars with all of your favorite treats are in the park. One is located near the swimming pool, the other near the sky lift. My grandfather loved this place and brought me up to visit each year since I was a kid. That was 40 years ago and I have been taking my kids and their friends to hike and sight see. This park represents to me all of the beauty of Kentucky. There is no other place like it. 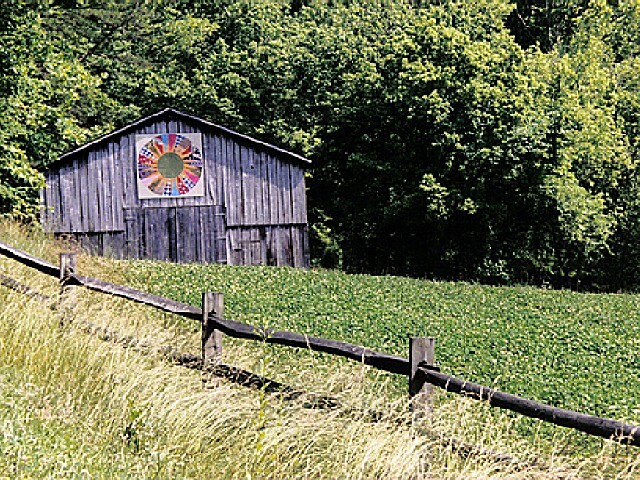 A hidden gem in Kentuckey. If you go there you will be glad you did. I loved it. Can hike on trails, take long walks using paved trails, relax by the pool or on your balcony. Can see the beauty of the Natural Bridge and the surrounding area.